Bolton earned an All-Star nomination in 2011. 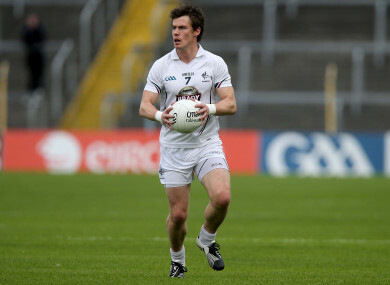 KILDARE DEFENDER EMMET Bolton has announced his retirement from inter-county football. Bolton has been a key member of Kildare’s defence since making his senior debut in 2007. He earned an All-Star nomination in 2011, and was named on the 2010 GPA Team of the Year following a season where they narrowly lost out to Down in an All-Ireland semi-final. He also represented Ireland in the 2011 International series. Bolton suffered a burst appendix before Christmas last year, but continued to make a contribution during their campaign. Bolton announced his retirement on Twitter on Friday evening. Email “Kildare stalwart defender Emmet Bolton announces retirement from inter-county football”. Feedback on “Kildare stalwart defender Emmet Bolton announces retirement from inter-county football”.